I can’t believe it’s been almost 7 months since I’ve last posted on here. Oh my!!! I took some time for myself these past few months to focus on school, work, extra curricular’s and (as of lately) managing a no dairy diet. Now THAT has been a time!!!! I apologize for being so absent on here. 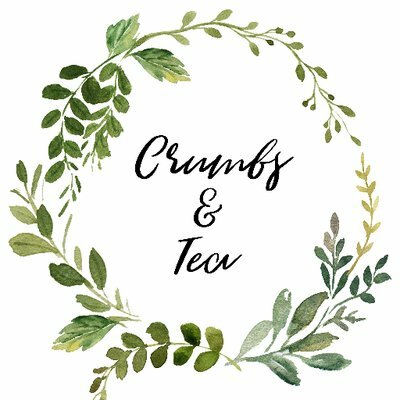 Starting now, I have a lot of baking to do during the month of December, in which I will be documenting everything and posting on here. 🙏 for Christmas baking. To kick things off, I’d love to share with you my bride and groom cake pops I made for my best friend who is getting married. Her wonderful boyfriend popped the question Saturday afternoon, and I was beyond thrilled for them both. I’ve never actually made cake pops before (surprisingly enough), and to be quite honest these were very tricky. I think if I were to just make solid colour cake pops, it would have been easier. But doing the little decorations, was a very tedious task that I wasn’t quite prepared for on my Saturday night at 8:30pm! Congratulations Becca and Jordan on your big day! Bake the cake as directed on the box, using the 8-inch cake pan. Let cool completely. Crumble cake mixture into crumbs (so there are no big chunks of cake left). Start with adding 1/4 cup of icing into the mixture. The mixture should be moist enough to roll into 1 1/2-in (4-cm) balls and still hold a round shape. After rolling the cake balls by hand, place them on the prepared baking sheets and let them rest for about 20 minutes before chilling. Place the candy coating in a deep microwave-safe bowl. Melt the candy coating, by putting the microwave on medium power for 30 seconds at a time, stirring between each interval. 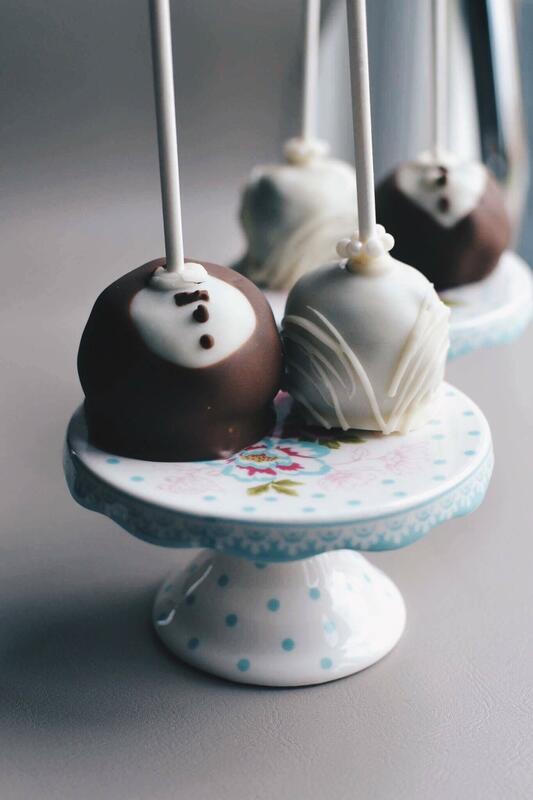 Time to dip the cake pops! One at a time, dip about 1/2 in of the tip of a lollipop stick into the white melted wafers, and then insert the lollipop stick straight into a cake ball, pushing it no more than halfway through. Holding the lollipop stick with cake ball attached, dip the entire cake ball into the melted candy coating until it is completely covered, and remove it in one motion. Make sure the coating meets at the base of the lollipop stick. This helps secure the cake ball to the stick when the coating sets. Allow any melted chocolate to drip off. 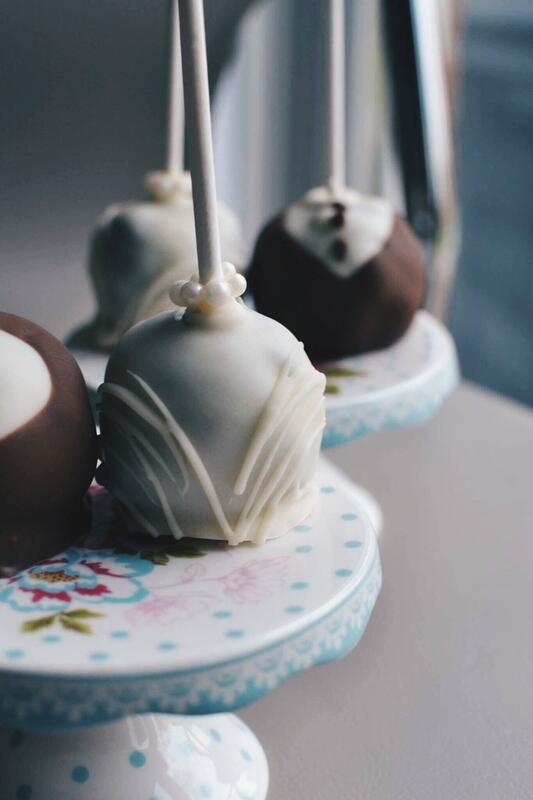 Repeat until all cake pops are covered in white chocolate. Transfer to freezer for 10 minutes. 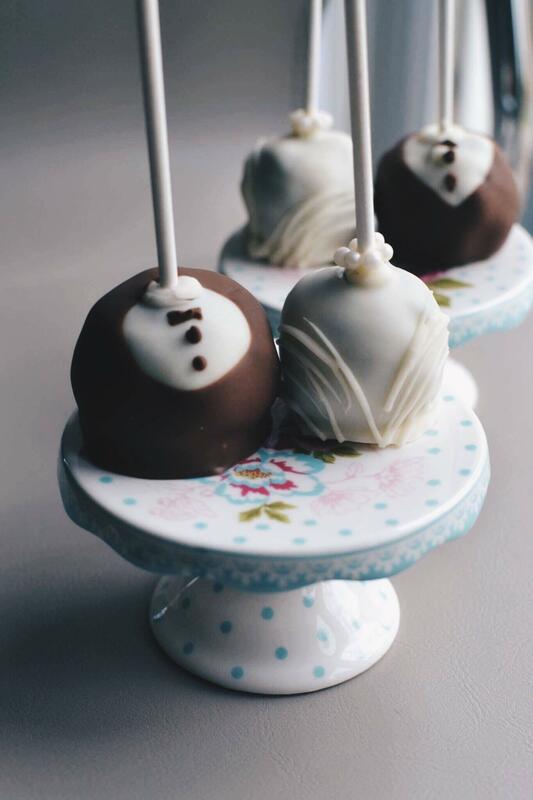 For the groom cake pops, melt the milk chocolate melting wafers the same way you did with the white melting wafers. Dip the cake pop into the melted milk chocolate, spinning the ball until it leaves you with a white triangle (“for the dress shirt underneath the blazer”). Repeat until all cake pops are completed. Enjoy!